There’s one word that best describes Japanese cartoons such as “Naruto”, and that word is “filler”. Lots and lots of filler. The type of television show that takes twenty episodes worth of plot and stretches in out to fit one hundred. Shows like “Dragonball Z”, “Inu Yasha”, “One Piece” and “Bleach”. I recognize why they employ these tactics (the shows are made concurrently with the comics but have to keep from catching up with the source material, which often times leads to entire fifty episode story arcs of pure, meaningless filler), but that doesn’t mean I have to like it. Thankfully, they also make movies. Much like the “Dragonball Z” movies I review so frequently for this website, “Naruto the Movie” cuts the crap and gets right to the point. It takes everything that’s decent about the show and leaves behind much of what makes it impossible for me to watch. But is it still any good? For those who don’t keep up with the show, Naruto Uzumaki (Maile Flanagan) is an obnoxious ninja boy with a nine-tailed demon residing within his body, which gives him incredible power. He is a member of Team 7, a group of young ninjas consisting of the quiet loner stereotype, Sasuke (Yuri Lowenthal), the brain-dead pink haired generic anime girl, Sakura (Kate Higgins), and their leader, the enigmatic adult ninja, Kakashi (Dave Wittenberg). Team 7 is given the mission of escorting the stuck-up actress Fujikaze Yukie and her film crew to the Snow Country. However, along the way they discover that Yukie is actually the deposed Princess of the Snow Country, Princess Koyuki Kazehana. Team 7’s job meets with complications when they are attacked by a band of rogue ninjas, lead by Doto Kazehana, who wants Yukie’s necklace as it is in fact the key to the Snow Country’s greatest treasure. Alright, so it should be fairly obvious that I’m not the biggest “Naruto” fan in the world. So then, why did I go see this movie for it’s extremely limited (one night, one showing, in select theaters only) theatrical release? Because America doesn’t make cel-animated movies anymore. Or, we don’t release them theatrically, anyway. As a matter of fact, the last cel-animated cartoon I saw in theaters was the “Full Metal Alchemist” movie…and I saw that when I was visiting Kyoto in 2005. I basically just wanted to see a cartoon on the big screen that wasn’t CGI. It really could’ve been anything. Still, like I said earlier, this movie leaves behind most of the things I hate about the TV series and was actually rather enjoyable. The various batshit-crazy ninja moves that characters execute in battle are a trip and remain very creative and visually entertaining. They employ them in lots of inventive ways that actually surprise the audience (I never see that damn substitution-jutsu coming no matter how many times they pull it). The story’s no great shakes, pulling quite a few ideas from the much-superior “Castle of Cagliostro”, even going so far as to have a predictable “the REAL treasure of the country is blah blah blah, which the villain could NEVER have!” trite ending. Yet, they tell the story in the span of 113 minutes instead of 113 episodes, so it has that advantage over the TV series. The animation is also pretty good. I mean, you can tell the budget wasn’t cosmic or anything, as the animation is only a bit better than the TV show’s, but it’s still very technically sound and the fight scenes are pure eye candy. A lot of “Naruto” fans express loathing for the English dub of the show, but I’ve never really found it all that bad. Well, save for that ”Believe It!” thing, but thankfully they keep that to a minimum. Now for the stuff I hate. I hate most of the characters. That’s right, even Sasuke. The cast is basically made up of every shallow anime character template you can think of. I think Sakura is my least favorite, as the extent of her personality is “I love Sasuke, TEE HEE!” Naruto’s brand of obnoxious buffoonery can actually be endearing at times. I found the scene where Yukie maces him in the face and buries him under a pile of logs to be pretty funny. I suppose if I had to like one character, it would be Kakashi. He seems to be aware that every other character in the show is annoying as all Hell. So did I like the movie? Eh, not really. But I’m not a “Naruto” fan, so it really wasn’t geared for me. I did enjoy seeing a well-produced cel-animated feature film on the big screen, so it wasn’t a total loss. 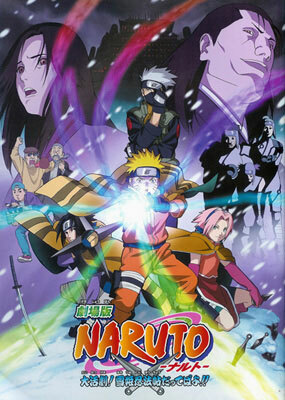 “Naruto” fans are sure to enjoy it, and since they’re the target audience, I guess the film achieved its goal.